The COMSOL Conference 2015 Grenoble was a great opportunity for attendees to receive training, network, and learn more about the many applications of COMSOL Multiphysics. The papers and posters presented at this year’s conference covered a wide range of topics and industries, each demonstrating the power of simulation in advancing innovative research. Let’s learn a bit more about the Best Paper and Best Poster award winners. Each year, the COMSOL Conference receives a number of paper and poster submissions that showcase various uses of simulation and application design. These presentations speak to the strength of COMSOL Multiphysics in both academic research and innovative industrial applications, while also highlighting its broad appeal. The COMSOL Conference 2015 Grenoble featured more than 230 presentations, each of high quality and deserving of recognition. Among these presentations, the conference program committee selected five Best Paper and Best Poster award winners, with an additional award chosen by conference attendees. The topics of this year’s award-winning projects ranged from laser welding and fuel cell devices to loudspeaker designs and swimming fish. The teams behind each of these projects were recognized at an awards ceremony on the second day of the conference. Here, we’ll take a closer look at each of these projects. 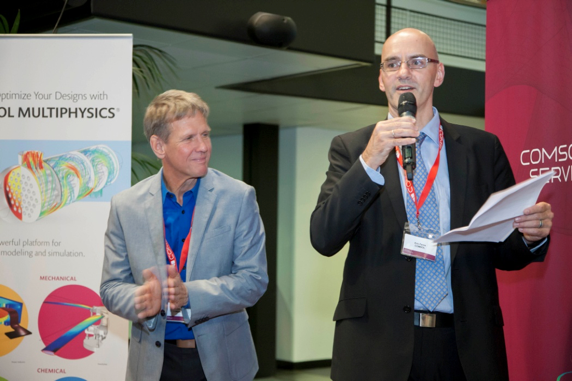 From left to right: Our CEO, Svante Littmarck, and the director of COMSOL France, Eric Favre, lead the awards ceremony. The first award was presented to Alexandre Métais, Iryna Tomashchuk, et al. from ArcelorMittal for their paper “Modelling of Transport Phenomena in Laser Welding of Steels”. Laser welded blanks offer a viable solution for reducing vehicle weight, while creating strong architectures through the tuning of different grades and thicknesses at the same time. To ensure the quality of the weld, it is important to obtain an understanding of the phenomena occurring within the laser welding process. Prompted by this notion, the team of researchers at ArcelorMittal sought to numerically and experimentally characterize the material mixing in a full penetrated laser welding process. Specific tracers were used to carry out the mechanism behind the formation of eddies within the weld pool. When choosing the tracer material, the researchers opted for nickel, as it is similar to iron in regards to density, heat capacity, and thermal conductivity. The simulation results were found to be in good agreement with experimental data, offering new potential in advancing laser weld mixing between dissimilar steels. John Blackburn et al. from the National Physical Laboratory also received a Best Paper award for “PEM Fuel Cell Using Equation Based Simulation”. Proton exchange membrane (PEM) fuel cells are one of the principal types of fuel cells, with applications in transportation and power generation. Performing detailed analyses of the complex mass transport and electrochemical phenomena occurring within these cells can help optimize their efficiency. An increase in efficiency translates into lower costs pertaining to the design and operation of fuel cells. At NPL, researchers developed novel partial differential equations (PDEs) from first principles, producing a more realistic model than those examples shown in literature. To solve their derivation equations, the team used two techniques in COMSOL Multiphysics. The first of these techniques was to combine built-in interfaces from the Chemical Reaction Engineering Module. The second was to utilize equation-based modeling to enter equations explicitly with the “coefficient mode”. The simulation analyses from the two techniques showed the same results, the latter of which offers the possibility of generalizing the model further down the road. The final Best Paper award was given to Michele Curatolo and Luciano Teresi from the Roma Tre University in Italy for their paper “The Virtual Aquarium: Simulations of Fish Swimming”. With relevant developments pertaining to robotics, biomechanics, and mathematical modeling, fish swimming is an important area of research. The goal of this study was to create a virtual aquarium, with a focus on reproducing the key elements of carangiform swimming. This style of swimming is one of the traditional categories that is used to describe fishes’ patterns of wavelike motion. In their analysis, the research team ran 2D simulations using the Fluid-Structure Interaction interface in COMSOL Multiphysics. By defining a pattern of muscle activation, with regards to space and time, they were able to reproduce the proper wavelike motion of a fish-like body. Along with demonstrating the ability of COMSOL Multiphysics to tackle such a problem, their simulation research also paves the way for continued advancements in this field of study. The Best Paper award wasn’t the only award of the night for Curatolo and Teresi. They were also presented with the popular choice award for Best Poster, as voted upon by conference attendees. The first Best Poster award of the night was given to Xavier Corbella et al. from the Escola Universitària d’Enginyeria Tècnica Industrial de Barcelona in Spain for the poster “Modeling an Ejector for Hydrogen Recirculation in a PEM Fuel Cell”. Svante Littmarck presents a Best Poster award to Xavier Corbella. Hydrogen recirculation systems have been recognized for their ability to improve the efficiency and durability of PEM fuel cells. 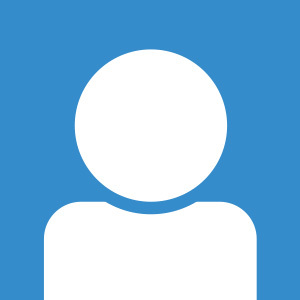 In these systems, a pump, a compressor, or a passive device such as an ejector returns unused gas to the inlet. Ejectors are particularly beneficial in the sense that they require little maintenance and feature no parasitic power or moving parts. To analyze the impact of ejector-based hydrogen recirculation systems on PEM fuel cells, the researchers implemented their ejector design in COMSOL Multiphysics. The model was validated experimentally with air and when compared to the simulation results the two were shown to be in good agreement. After validating the model, the researchers conducted a parametric study to determine the optimal geometric parameters for the ejector design. The resulting configuration has been useful for hydrogen recirculation in PEM fuel cells and studying the flow within them. The second award was presented to François Malbos et al. from Harman International for “Loudspeaker Simulations in a Car Cabin”. In the automotive industry, the placement and positioning of speakers plays an important role in the acoustic performance of vehicles. Simulation methods are often used as a means to identify these optimal parameters and ensure the best audio performance. Looking to improve the accuracy of audio simulations, the team of researchers at Harman International simulated a loudspeaker’s sound pressure within a car cabin using COMSOL Multiphysics, along with the Acoustics Module and LiveLink™ for MATLAB®. The pressure comparison between the simulation results and the measured data for six microphone arrays at the four seat positions showed a very good correlation. This agreement demonstrates the accuracy of loudspeaker simulations performed in COMSOL Multiphysics. 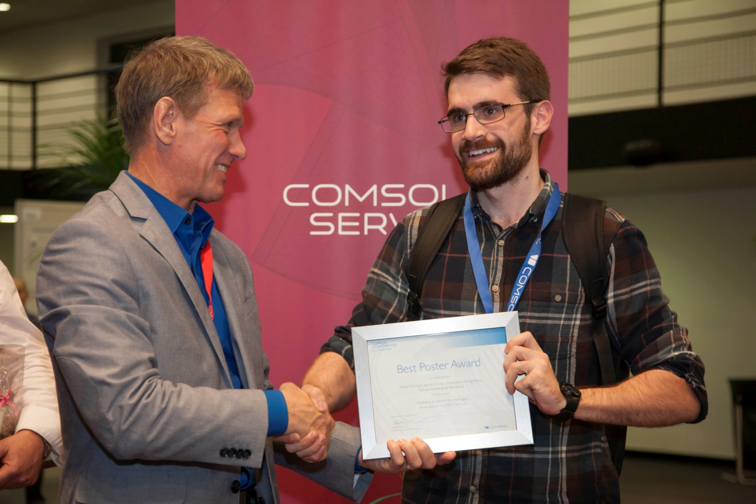 The Best Paper and Best Poster award winners at the COMSOL Conference 2015 Grenoble. From left to right: Iryna Tomashchuk, Michele Curatolo, Luciano Teresi, François Malbos, and Xavier Corbella. 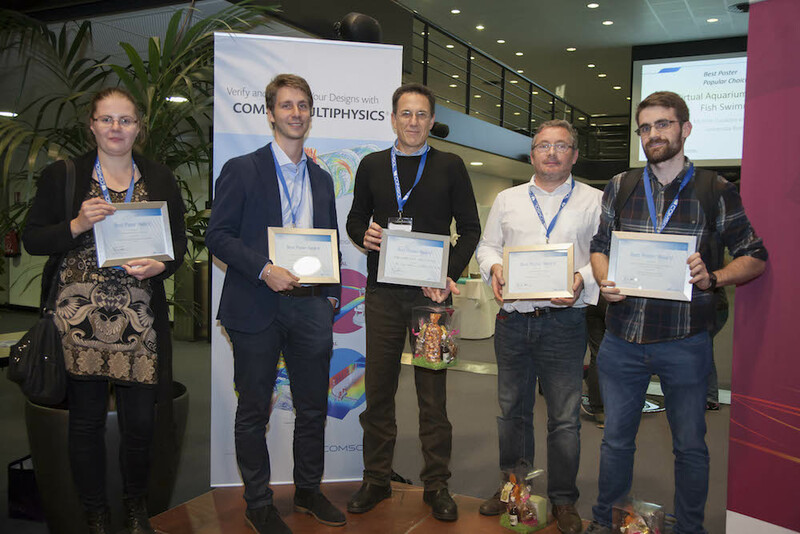 We would like to congratulate each of the Best Paper and Best Poster award winners from the COMSOL Conference 2015 Grenoble. It is an honor to hear about the interesting research of our users and be able to recognize your efforts each year. We look forward to seeing more innovative research in 2016!